The Kellogg Community College Faculty Biennial Art Exhibition opens Tuesday, Jan. 22, and includes ghostly images of trees, eye-catching graphic design posters, photographs of stunning landscapes and more. The exhibit runs through Feb. 15 at the Eleanor R. and Robert A. DeVries Gallery in KCC’s Davidson Visual and Performing Arts Center, located on campus at 450 North Ave. in Battle Creek. The public can view the exhibit for free during regular business hours, which are 8 a.m. to 4:30 p.m. Mondays through Fridays. An opening reception will be held at the gallery from 4 to 6 p.m. Thursday, Jan. 24. 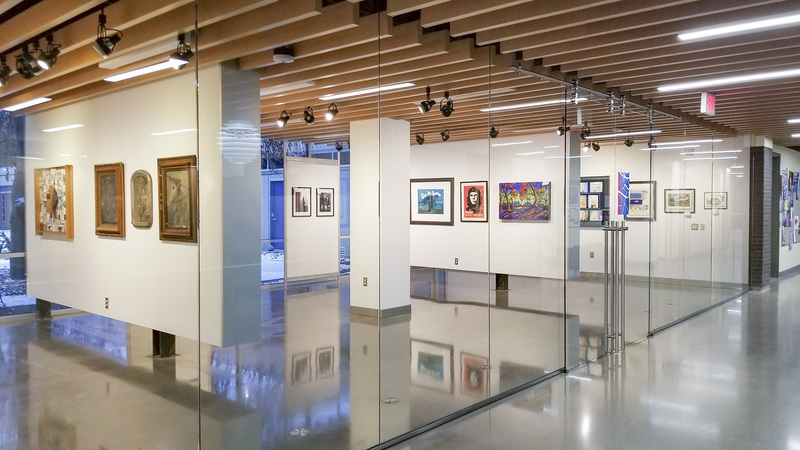 Works from 10 faculty artists will be on display in the exhibit, which is held every other year to highlight the talent of the College’s art faculty. Mediums featured include woodcutting, daguerreotype, painting, photography and mixed media, among others. One piece, by art professor Pete Williams, features a collage of images from a Buddy Holly scrapbook he found at a garage sale in Battle Creek, set against a background of vinyl records. The 60th anniversary of Holly’s death is Feb. 3, Williams – a self-described rock and roll geek – pointed out. Another example of the range of art at KCC is the work of KCC Photography and Multimedia Program Coordinator Ryan Flathau, which features images of antiquated methods of photography: ambrotype, daguerreotype and tintype. View a 360-degree tour of the exhibit below or click here to view the tour online via Google Poly. For more information about the KCC Faculty Biennial Art Exhibition, contact Flathau at 269-965-3931 ext. 2559 or flathaur@kellogg.edu.